A different way to eat corn starch gummies covered with chili lollipops tamarind flavor candy, Jelly Fire! With an intense & spicy tamarind flavor these soft gummy lollipops are one of the best Mexican candies. Tama King's spicyness is so fruity its intense!! Manufactured by Dulces Karla. Ingredients: Sugar, corn starch, water, powdered chili, salt, citric acid, artificial flavor and artificial color. Paletas de gomita de almidon cubierta con chile picoso sabor tamarindo de Dulces Karla. 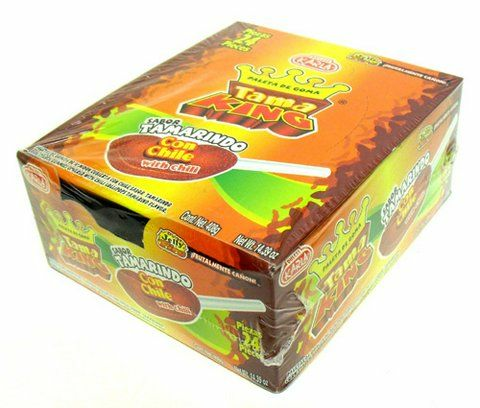 Con un sabor intenso y enchiloso estas deliciosas paletas de gomitas son unos de los dulces mas ricos de Mexico. 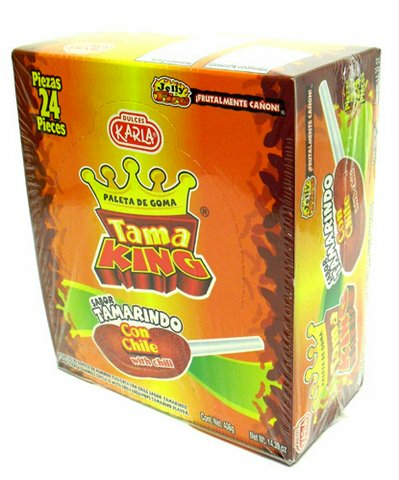 Los Tama King son tan picantes, que son frutalmente ca�on! Fabricado por Dulces Karla. Ingredientes: azucar, glucosa, almidon de maiz, agua, chile en polvo, sal, acido citrico, saborizantes y colorantes artificiales. This gummy lollipop has it all for me. Spice, sour and then sweet in the inside plus chewy. It wakes me up! I just wish it was free shipping if you buy more than 1 box.